Portland, ME April 19, 2017 – Chalkline has added another integration tool to VisiSpecs enabling customers to further coordinate construction drawings and specifications. The new VisiSpecs Keynote Manager not only provides coordination and verification but also saves customers hours on each project eliminating the need to manually filter master keynote lists to project specific lists. VisiSpecs Keynote Manager integrates the master keynote management and automatic project keynote filtering ensuring high quality and coordination construction documents. The VisiSpecs Keynote Manager enables customers to import their existing master keynote list instead of creating a new list for each project. Editing keynotes manually in Excel, Notepad, or 3rd party tools that are not integrated with their BIM models or specifications is time consuming and inevitably causes design errors leading to RFIs, Addendums, and Change Orders. VisiSpecs Keynote Manager provides complete control over the keynotes including adding, deleting, editing, sorting, and commenting with all modifications tracked by date and user. With the click of a button, all keynotes linked to specification sections may be included with others filtered out. VisiSpecs doesn’t force deletion of keynotes so as the design progresses it is easy to automatically add keynotes for sections added while verifying keynotes that are not included for sections that have been removed. 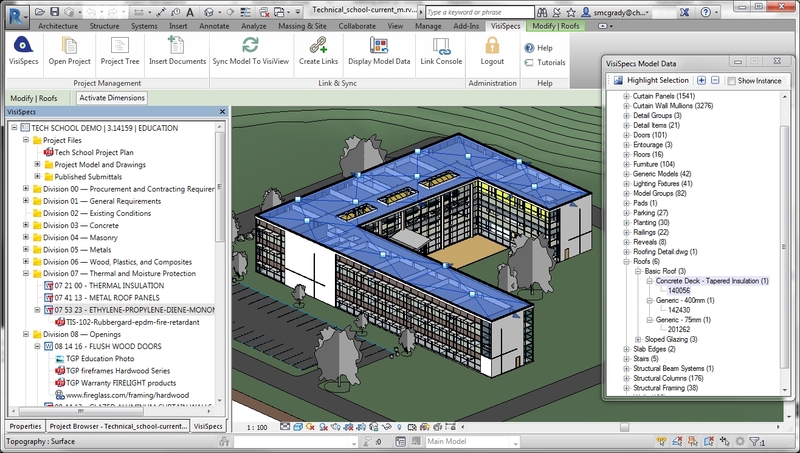 Keynotes may be viewed either in a grid structure making it easy to sort, select, comment, and edit or viewed in a tree structure similar to Autodesk Revit keynote views with the ability to edit the VisiSpecs keynotes directly in the tree view. VisiSpecs Keynote Manager also offers pre-selection of master keynotes and annotations to be included in all project keynote lists helping to save even more time. A 3-state selection feature gives users a clearer indication of their choices on the keynotes and ability to export only selected project keynotes from the master list. Keynote duplicate checking and correction are included along with spell checking to ensure keynote lists are accurate. Users new to VisiSpecs will find the importing of their project documents and keynotes fast and easy with the immediate benefits of using the new VisiSpecs Keynote Manager and BIM model integration and verification. Visit www.chalklineinc.com or email [email protected] to learn more about the VisiSpecs Keynote Manager and to request the free trial, register for live webinars, see customer testimonials, and download product information. Portland, ME March 08, 2017 – Chalkline announces the release of VisiWord v17.1 which includes a number of customer driven features and enhancements. Features include new Design Manager Templates for formatting all documents in a project to ensure a consistent look and feel. This feature, a high priority for many customers, relieves the tedious and time consuming effort required to format project documents to meet client demands. The VisiSpecs Design Manager controls the look and feel of the documents both during editing as well as publishing submissions. One format does not fit all client needs. Changing the page layout, fonts, paragraph spacing, headers/footers, number spacing and more is difficult to do and error prone. Whether managing the layout and format of a single document or hundreds, VisiSpecs gives users the advanced control over their documents to get their job done faster and to deliver a higher quality product. VisiSpecs Automatic Style formatting enables the delivery of the final product in the right format meeting the client’s needs. The styles may be user defined and vary depending upon the document set as VisiSpecs does not force one format to be used for all documents. Using the powerful style features of Microsoft Word with the VisiSpecs project document control and publishing delivers the optimal solution. Engineers are asked to meet the document formatting and Header/Footer requirements of many architects which can be very time consuming and error prone. With VisiSpecs, Architects can either have the engineer work on the same project through VisiSpecs project sharing or email the architects Design Guide Template which assigns the correct header/footer and format to the engineering documents. Inserting documents from manufacturers or various web sites requires modifying all the formatting to match the rest of the project documents. This is also very time consuming requiring stepping through the entire document to match the format, numbering, and layout. VisiWord v17.1 includes a Style Mapper to quickly convert the styles to a customer’s standard set of styles. With the consistent set of styles, the ability to reformat the entire project is enabled by the VisiSpecs Automatic Style application in v17.1. VisiWord v17.1 also includes better user control over the Publishing Path saving time coordinating documents for delivery with all the other project documents. For project teams, Chalkline also added an Activity Report letting users know what other team members have been doing within the project since their last login. Additionally, ribbon menu selections have been reorganized facilitating ease of use and time savings. 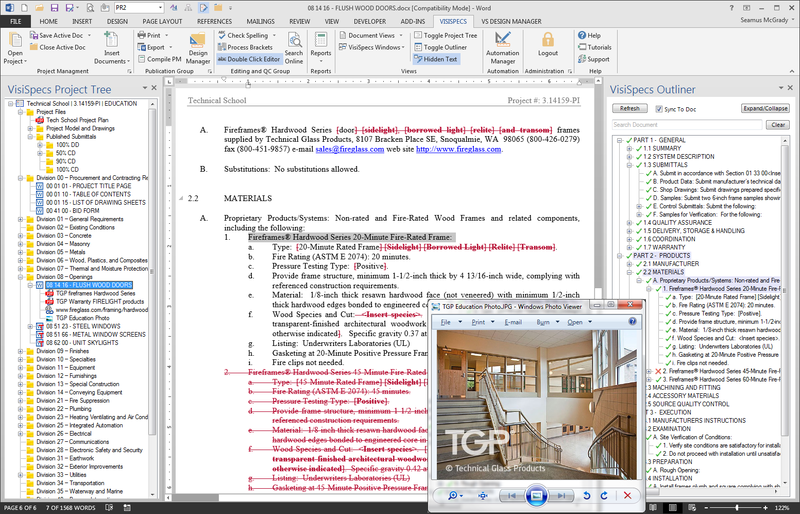 Portland, ME, February 8, 2017 – Chalkline is pleased to announce the availability of the first application to offer coordinated constructions specification writing directly in Autodesk® Revit®. VisiSpecs™, The Next Generation of BIM Integrated Specifications has taken another leap forward centralizing the construction document coordination with the BIM model. 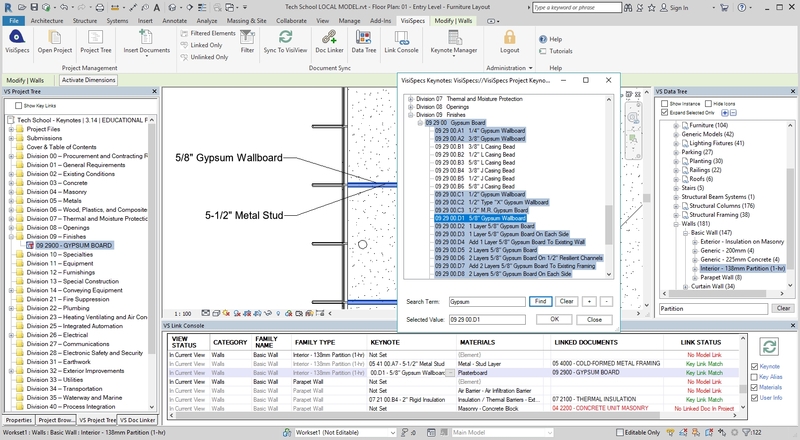 Project Architects, Engineers, and Designers who are using Autodesk Revit to model their designs are now able to also write the coordinated construction specifications side by side with the model. As BIM elements get added to the model, the linked specifications for that element can also be included. As the linked models are added, the specifications for those linked elements can also be added and coordinated with the project specs. Integration and verification of the BIM model and specs without having to export the model first means tighter integration, simplified processes, less data management, and fewer errors and omissions. Contractors can easily link the specs and docs to their construction intent BIM model for estimating, bidding, construction administration, as-builts, and commissioning. VisiRevit™ provides the coordination, automation, and verification of the BIM model and specifications reducing design time and errors while improving project data access to the users in the application they already have installed. Chalkline is delivering the most integrated construction document solutions by leveraging the tools already being used resulting in less implementation effort and higher adoption rates. VisiWord™ enables users to edit directly in Microsoft Word with additional spec editing and project management functionality like the customizable project tree, spec editing tools, header/footer and TOC management, and complete publishing of all documents. As VisiSpecs integrates with client’s BIM model element and material standard naming conventions, the BIM model does not need be changed in any way. This enables immediate integration of the BIM model and specifications delivering more coordination and verification improving product quality. 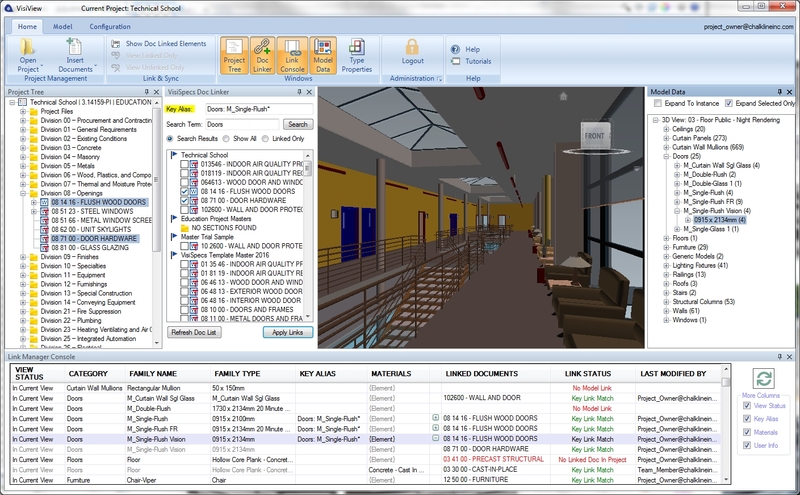 VisiWord is document neutral and BIM models don’t have to change meaning clients are able to download the Free VisiSpecs Trial and immediately link their models and specs. Spec editing in Microsoft Word is both familiar and feature rich while the enhanced editing features and publication tools provide time and cost savings in writing project manuals. Team collaborators can simply open Word to read and comment on specs as well as other related project files and data linked in the project. 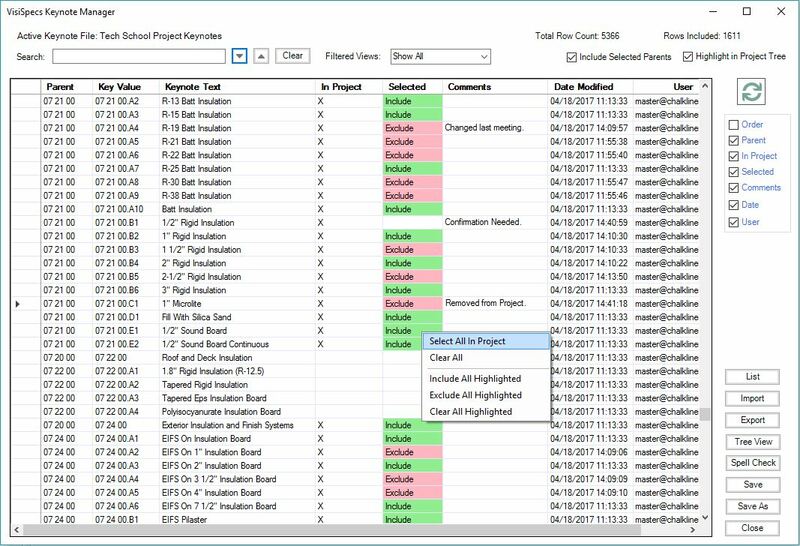 As the BIM model and specs continue to be designed and written, the verification and coordination checks are done either in Revit or in VisiView™ for those not using Revit. VisiSpecs upgrades the editing and publication tools for specifiers while simplifying the BIM model coordination process by not forcing any changes to the existing models. VisiSpecs can also help to highlight areas of the model needing improvement or data changes further improving the quality of product delivered. 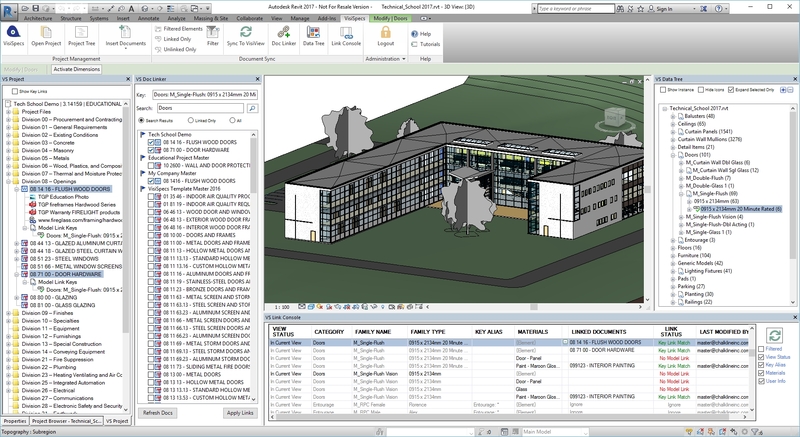 Through live model and spec coordination directly in Autodesk Revit, users are not left wondering how old the data is and what has changed since their export. Portland, ME December 9, 2016 – Chalkline is pleased to announce the scheduling of Free Live Webinars. Attendees will learn about the Chalkline company and strategy, VisiSpecs BIM integrated Specs + Docs applications, and the ease of implementing VisiSpecs at their firm. VisiWord, VisiView, and VisiRevit applications will be shown and there should be ample time for Q&A. VisiSpecs Webinars are FREE, but do require registration. Visit the VisiSpecs Events page for more details. VisiView provides visual and data access to the model along with automation and verification enabling highly coordinated project documents to be designed and delivered. Portland, ME Nov 21, 2016 – Chalkline, Inc. continues to work with customers to increase efficiency, add functionality, and improve the ease of implementation. Customers using VisiSpecs are providing feedback on new feature requests and enhancements and seeing the new functionality updated in as little as a day or two with the automatic update features. Chalkline is also taking advantage of the existing and well known applications, like MS Word for instance, so development can focus on improving the integration, processes, and spec editing features. Customers using VisiSpecs see the automatic updates as soon as they are released helping to ensure the highest quality products and features are available without spending IT time updating applications. Visit the Chalkline web site and/or contact [email protected] to learn more about the Introductory Discounts up to 40%, promotional monthly drawings for FREE licenses, and to get started downloading your Free 30 Day Trial. VisiView is one of the VisiSpecs applications providing visual and data access to the model. Automation of linked docs and verification enables higher coordination of products designed and delivered. to the Architectural, Engineering, Construction, and Owner/Developer marketplace. A successful 6 month Beta Program for both Chalkline and VisiSpecsTM users has resulted in real world usage, collaboration with customers, added features, and user experience enhancements. The Free Trial of VisiSpecs enables users to quickly integrate their own documents and BIM models without spending money, requiring costly IT resources, or buried in weeks to months learning new tools. Since VisiWordTM is a Microsoft Word Add-In, the integration of customer documents takes just minutes to complete. Users don’t have to learn to use a limited editor or lose their office integration or custom macros and VBA apps they currently use. Since the BIM models, families, and materials do not need to be modified, the integration to existing project models is immediate. The Free Trial lasts 30 days, however users can import their project documents and start integrating to their BIM models typically within hours since modifying their documents or BIM models is not required. Multiple team members can even access and collaborate on projects using the Free Trial. Deployment of the VisiSpecs solutions is also easy and low cost due to the VisiSpecs Hybrid Cloud solution. Corporate accounts, master libraries, projects, models, and other content are all securely managed in the cloud with user access on demand from the office, home, or while traveling without jumping through IT hoops, punching holes in firewalls, setting up VPNs, or waiting for IT admins to download, install, configure, license, and maintain the typical SQL server applications in the marketplace. Visit the Chalkline web site and/or contact [email protected] to learn more about the Introductory Discounts up to 40%, promotional month drawings for FREE licenses, and to get started downloading your Free 30 Day Trial. Portland, ME, July 13, 2016 – Chalkline, Inc. has confirmed the pricing, licensing, and promotions for VisiSpecsTM, The Visual Specification System, due to be released later this month. VisiSpecs Licensing and Pricing is value justified from the smallest of firms to the largest global enterprise firms. the functionality and pricing options to best suit their budgets and implementation plans while also offering the smallest of firms a low entry price point. Larger firms require more integration and collaboration functionality with the ease of data access in the cloud and simple deployment across their offices around the globe. Smaller firms may initially only need easier and faster specification writing and publishing tools with fewer collaborators. VisiSpecs is adopting the user based license subscription model which is becoming popular and familiar to clients in the AECO market. Basic, Standard, Premium, and Enterprise level Editions will offer value based pricing levels for the functionality and size of the firm’s implementation. Smaller firms can start at a very low price point and as they grow and their implementation fills out, the price level adjusts according to the value received. Enterprise level firms can deploy a very large number of users with capped per user prices and multi-year discounts. Pricing will be available on an annual reduced price or customers have the flexibility for month to month pay as you go payments and licensing. VisiSpecs offers license subscriptions based on levels of functionality, number of users, server storage space, and user adoption metrics. Larger firms can take advantage of the Enterprise licensing managing more projects and data with reduced IT requirements based on the Hybrid Cloud solution deployment of VisiSpecs. Smaller firms also reap the IT savings of the Cloud solutions while initially starting without the BIM integration and coordination which can be added as they are ready. VisiSpecs data is stored in Microsoft’s Azure Data Centers, which guarantees an industry leading 99.99% availability. All VisiSpecs databases are protected by redundant backups and replicated servers with automatic failover. To ensure availability for disaster recovery purposes, VisiSpecs data is also replicated on a continuous basis to a secondary Microsoft Azure Data Center located in a different geographic region. This Active Geo-Replication protects the data from a catastrophic failure within the primary data center due to natural disasters or other causes of prolonged downtime. FREE VisiSpecs Trials enable all the functionality for users to import their current projects and BIM models and start linking them within just an hour or two. The return on the investment is easy to justify as the user pricing only requires 1-2 hours of savings to be recognized. The upside includes reduced IT management costs, access to centralized project files and data, improved team collaboration, coordination and verification of construction documents, and more. Introductory discounts are aggressive at 40% off licenses and Free Video Tutorials (a $300 value) for orders by December 31st, 2016. A 20% license discount with Free Video Tutorials is available for orders by March 31st, 2017. Educational curriculum licenses is highly encouraged and will always be free of charge. 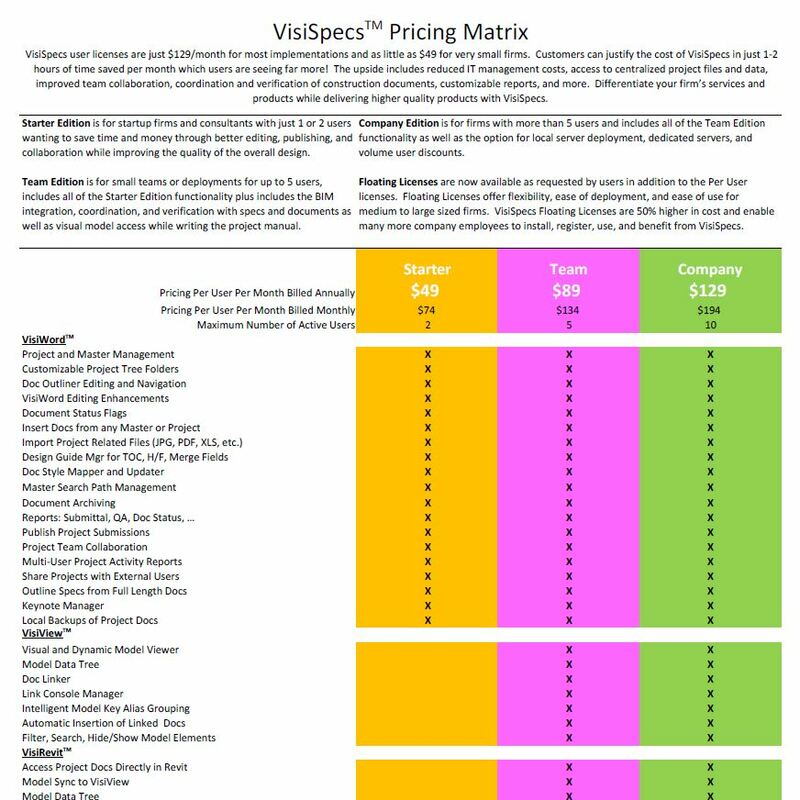 For more information on the VisiSpecs pricing and licensing, please visit the Chalkline web site. Those interested in accessing the final Beta version of VisiSpecs or receiving a specific quotation for their VisiSpecs implementation should email [email protected]. 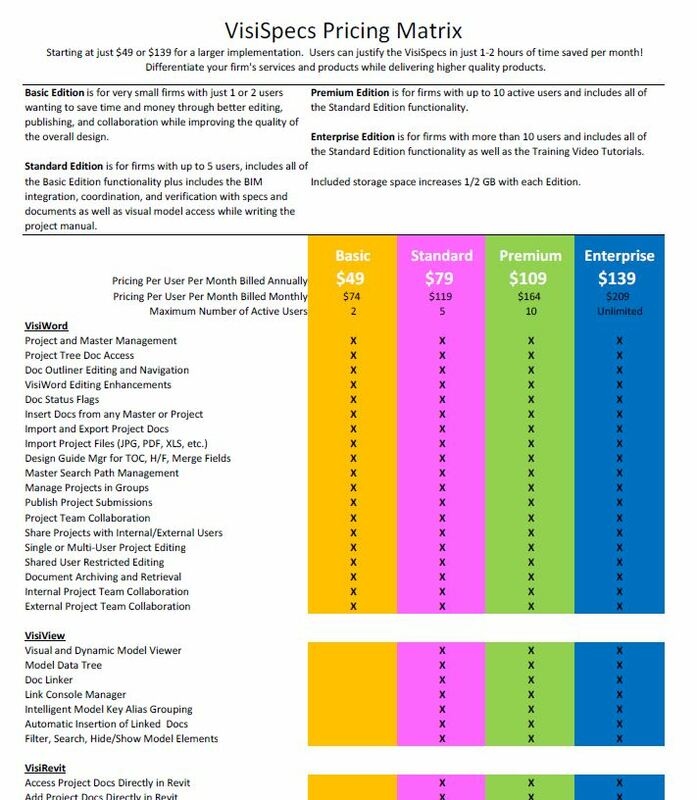 Portland, ME, May 18, 2016 – Chalkline, an Autodesk Architectural Engineering and Construction Industry Partner, is pleased to announce VisiSpecs, The Visual Specification System, is available for the latest Autodesk Revit 2017 software suite of applications. 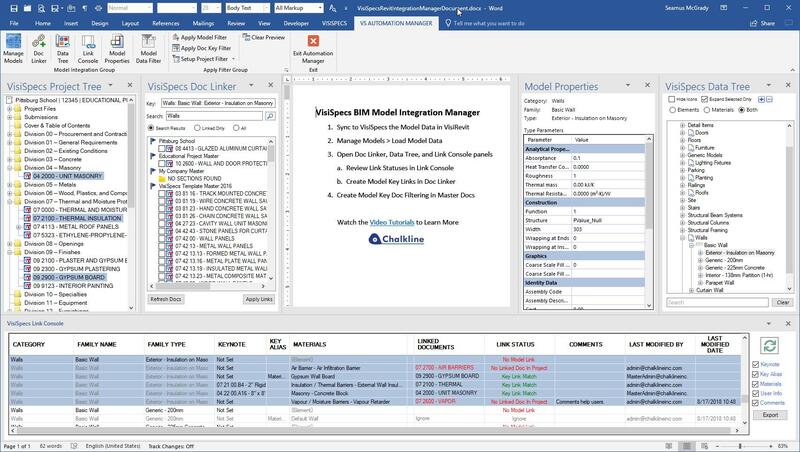 Chalkline is committed to quickly providing the next generation of Building Information Modeling (BIM) integrated specifications and document solutions to clients updating to the latest Autodesk applications. VisiRevit 2017 is available for clients integrating and coordinating their construction documents and BIM models. 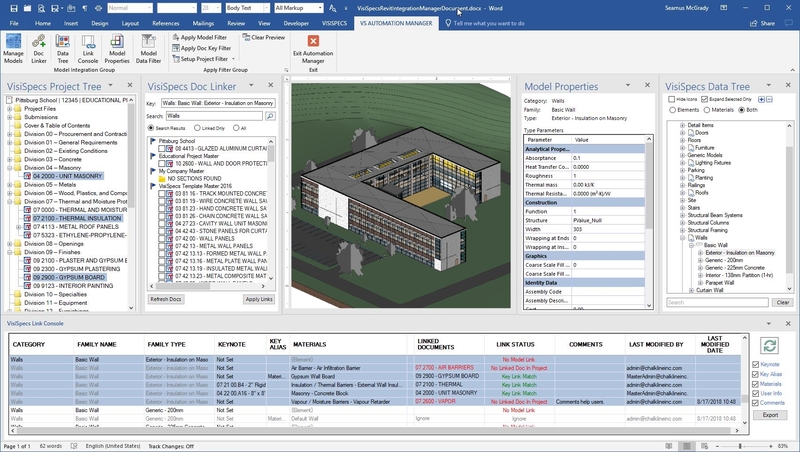 The advanced integration linking, direct access to specifications and other documents directly in an Autodesk Revit model, and team collaboration enable time and cost savings while improving delivered product quality. VisiRevit 2017 joins the VisiRevit 2015, VisiRevit 2016, VisiView, and VisiWord suite of applications. Those interested in learning more should email [email protected]. Portland, ME, April 19, 2016 – Chalkline is a company focused on collaborating with clients and partners to deliver the next generation of solutions to fulfill the promise of BIM integrated construction specifications and other documents. We are pleased to announce the development of VisiSpecsTM, The Visual Specification System. VisiSpecs suite of applications will be called VisiWord, VisiView, and VisiRevit. VisiSpecs will have flexibility in licensing and pricing for larger enterprise accounts as well as the smallest of firms. Free Trials for users and Free Licenses for Educational Curriculum and Beta Program Member users will help to speed adoption of VisiSpecs. Construction document support is the broadest available in the market as all Word documents in any format can be linked and integrated with BIM models and accessible via all team members through the Cloud based solutions. Users will find the visual interaction between the models and the documents to be the most advanced and easiest to use with the ability to drill into more detailed parameters in the model and documents as needed. Clients interested in working closely with Chalkline on the pre-release versions of VisiSpecs solutions should contact [email protected] for more information about the VisiSpecs Beta Program. Chalkline plans to officially release VisiSpecs suite of applications to the market after an additional testing and collaboration phase with Beta Program Members.